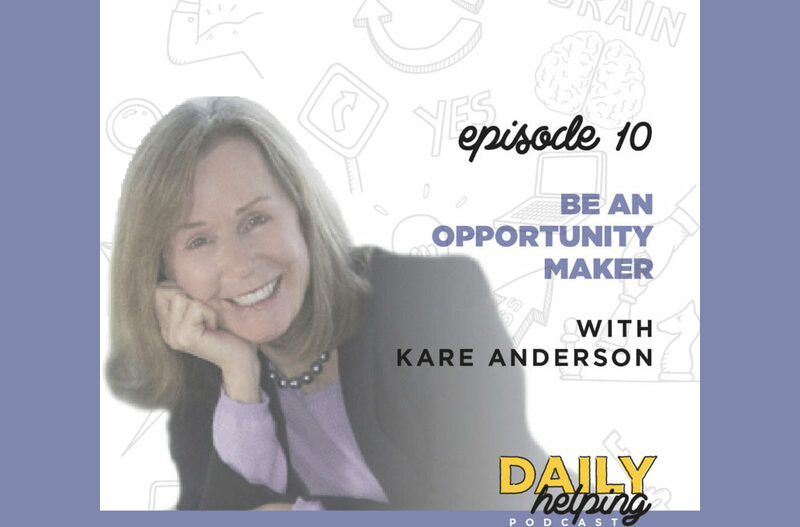 Today our expert guest is Kare Anderson, an Emmy-winning former NBC and Wall Street Journal reporter, now connective behavior speaker and columnist for Forbes and Huffington Post. In Kare’s TEDTalk, The Web of Humanity: Becoming an Opportunity Maker, she mentions being a phobically shy, stuttering young girl. However, a couple influential teachers and mentors gave her opportunities to find greater motivation. It’s vital that we learn more about ourselves because, until we know how we’re wired, we are living life reactively. These experiences were incredibly influential in Kare’s life, and they led her to studying and speaking about connective human behavior. One of the behaviors she’s studied is how people can communicate to connect. The key, she believes, is specificity. Once we get specific, we gain greater self-clarification and people listen sooner – so specificity not only increases clarity, but also credibility and memorability. Incorporate Triangle Talk: address someone else’s interest, confirm that is of interest to them, and suggest a way your interests coincide. Speak with AIR: make your communications Actionable, Interesting, and Relevant. It’s increasingly important that we connect with others because the world needs more opportunity makers: people can see an opportunities or problems and then forge the right team to solve a problem or seize an opportunity, better and faster than others. An important skill for solving problems, especially in our politically polarized climate, is fostering mutuality: the ability to draw people away from conflict by creating or offering a better and mutually-appreciated action. Kare believes that, if we want a more meaningful life that’s more adventurous, we should embrace the opportunity to bring the right people together to support an action that matters to them – and we should take any opportunity to support others by highlighting their positive aspects, even if they’re not aware of it themselves. By being mindful of others in this way, and supporting them, we can connect others and help them find mutuality. What is your highest mission in life? Describe it in a way that is so concrete that other people understand what you mean. What are the 2-3 hot buttons that cause you to be most reactionary? By getting clear about those things, you’ll have a better understanding of what you might want to do differently in your daily life, and who you might want to bring into it.